To raise the standard of information provision and acknowledge genuine visitor information providers, tourism bodies across Australia have developed Visitor Information Centre (VIC) accreditation programs or policies with related standards. A trademarked yellow on blue italicised 'i' symbol distinguishes VICs that have achieved accreditation. The symbol assures visitors of high-quality information and professional standards. After extensive consultation with industry and government, Tourism and Events Queensland developed the Queensland VIC Signage Policy, launched on 18 April 2000. The policy outlines the conditions and requirements necessary to achieve accreditation and the use of the 'i' symbol. Only those VICs that meet the eligibility criteria and standards of the policy are authorised to use the symbol. To ensure the policy continues to provide a high standard and is maintaining visitor needs, the policy criteria were reviewed in 2013. The review and update was undertaken collaboratively with the support of the Queensland Information Centres Association (QICA). Download the Queensland VIC Signage Policy. VICs seeking accreditation are encouraged to read the eligibility criteria and complete an application form. 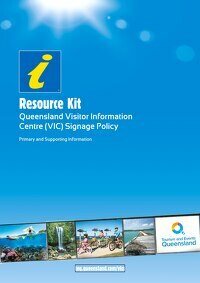 Tourism and Events Queensland has produced a Signage Policy Resource Kit that provides VICs with information to help achieve, maintain, and where possible exceed, the policy standards. The Resource Kit contains valuable information to help VICs successfully establish, operate and run a VIC in line with the policy standards. Areas such as management, marketing, compliance and insurance are covered. View the eBrochure below, or click here to download PDFs of each chapter.